When faced with a multi-phased renovation project, one of Texas' major attractions and fan favorite aquariums turned to Mahaffey Fabric Structures to deliver a temporary freezer structure for its beloved penguins. Mahaffey's extensive experience and expertise in providing insulated structures for special applications has helped demonstrate our success in providing insulated structures that can maintain temperatures as low as 9 degrees. In fact, Mahaffey Fabric Structures was the first company in the United States to successfully install a temporary structure to house ice carving attractions. Our team of highly trained, extremely capable professionals understand the complexities and engineering challenges that make these types of projects successful. With this in mind, our friends at the Texas Aquarium knew they could count on Mahaffey to be there, helping them face their challenges with confidence. While in the midst of a complete renovation of their Aquarium facilities, which was conducted in stages, the Aquarium came to a point where they did not have a facility to house their penguins in while their exhibit and home underwent renovations. As fate would have it, years prior to working on this project, Mahaffey had worked with the customer to provide an insulated structure for the ICE Land Exhibit. After initial discussions with upper management, Mahaffey Project Manager, Kevin Ponder (click here to meet Kevin now), advised that a similar structure could be provided to serve as the penguin’s temporary home. The biggest challenge faced is insulating the entire structure and ensuring that there is enough HVAC/Chiller capacity to ensure that the structure will maintain a constant temperature. In this project's case, the structure would need to stay insulated and kept cooled at all times as to maintain a temperature at or below roughly 40 degrees. Because of our previous success with the ICE Land project, and our demonstrated ability to provide an insulated structure with similar needs, Mahaffey teams had complete confidence in our ability to create an environment that would satisfy our customer and keep the penguins comfortable while renovations were being done. 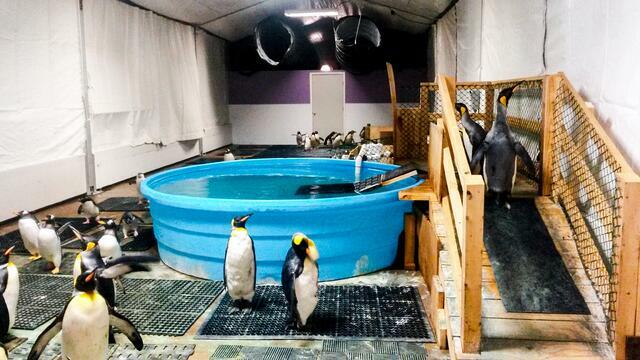 The penguins are currently being housed in a temporary location, but they are doing just fine! With the help of the same HVAC/Chiller contractor from the previous project, and our combined level of expertise, Mahaffey was able to provide an effective solution that the customer envisioned. Mahaffey's structures provided the Texas Aquarium with a solution that would allow them to complete their renovation on time, while most importantly, and keep their penguins comfortably cool in their temporary home. 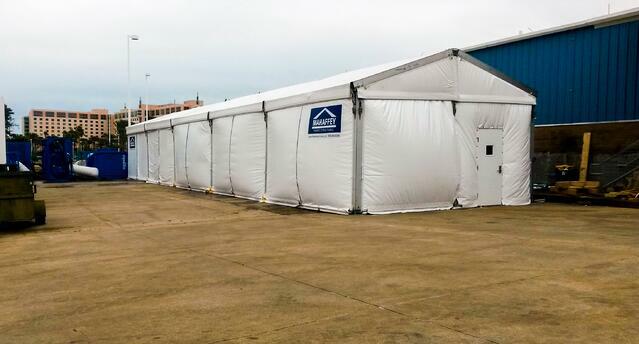 Mahaffey was proud to be able to provide the temporary tent quickly, ensuring that the Aquarium’s penguins had a comfortable living space — which enabled the Aquarium to house them at their facility and avoid shipping them to another facility for the 4 month renovation period. Are YOU in need of an insulated structure? Have some questions about our structures or services, or want to talk to one of our structure pros over the phone? If so, click below to get started.